Dorset Adult Aspergers Support - Getting to the Dorchester venue. Enter the church via Charles Street (not the South Street entrance). 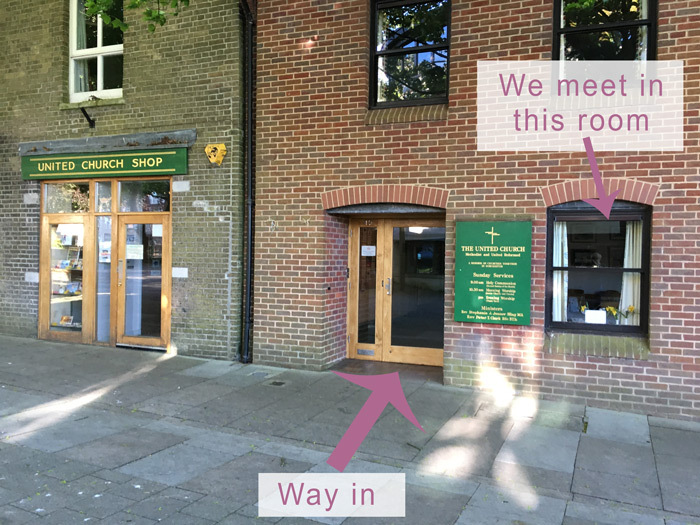 The entrance is opposite Dorchester Library between Dorchester Osteopaths and a Christian bookshop belonging to the church. This image shows where the entrance is, looking at it from the Old Market car park (the car park outside the library). The door in Charles Street is usually locked but most of the time there will be someone to open it. If there isn't anyone there, ring the doorbell or tap on the window to the right of the door. This is where we are having our meeting so we'll come and let you in. 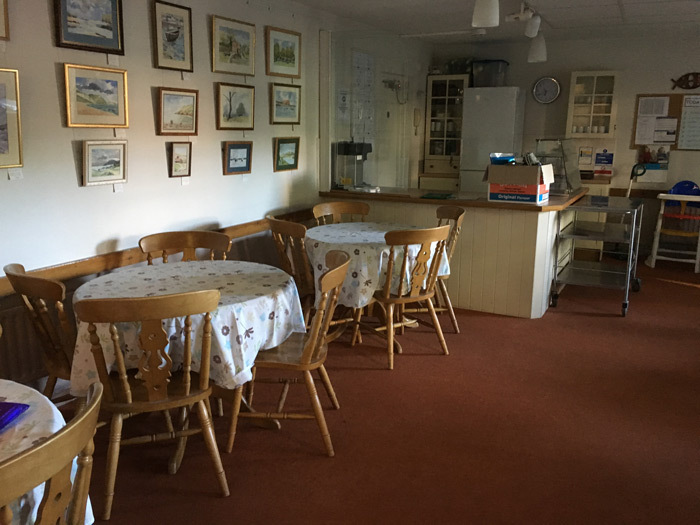 This is what the room looks like. 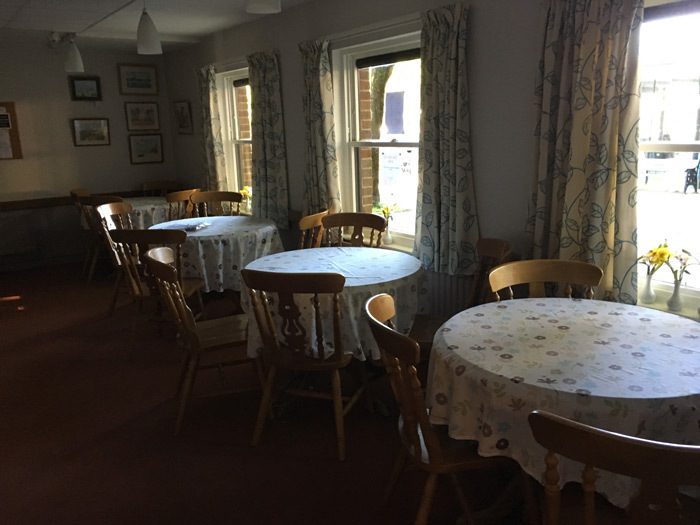 It may be arranged slightly differently for a meeting - the tables shown here may be moved so there is room for the speaker. You can park in the Acland Road or Old Market car parks. These are very close to the venue, parking is free after 6.00pm and there is never a problem finding somewhere to park. There are also a few disabled parking places by the entrance to the Hardye Arcade very close to the venue in Charles Street. 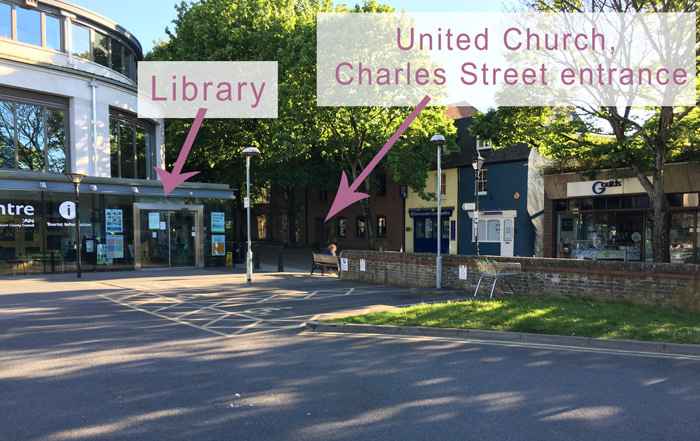 The venue is 10 minutes walk from both Dorchester South and Dorchester West Stations. At the traffic lights, turn right and walk down Weymouth Avenue. Follow the road as it bends to the right and becomes South Walks Road. Use the pedestrian crossing to cross over Prince of Wales Road, then cross South Walks Road also using the pedestrian crossing. Walk down South Walks road. You'll a modern building on your left. This is the library. Before you get to the library, turn left and walk down the pedestrian path, keeping the library on your right. The venue is on your left, opposite the library. When you come out of the station continue straight down the road to the traffic lights. At the traffic lights, cross over and continue straight ahead down Great Western Road. Cross over so you're on the left hand side of Great Western Road. At the end of the road, cross over Trinity Street at the traffic lights. Walk down South Walks Road keeping Coffee #1 on your left, and cross over South Street. You'll see the library in a modern building on your left. Turn left and walk down the pedestrian path, keeping the library on your right. Check bus times on the Traveline South West website.